Rejected Insurance Claims. Click or Call for a Free Consultation. Insurance companies routinely reject insurance claims that courts or arbitration later compel them to pay. Having your insurance claim denied is not the end of the road. There is hope. In most states, if your denial was less than one year ago, AAA Public Adjusters can evaluate your loss for free and determine if the denial you received was fair. In many cases, we have found that a denial issued by the insurance company was in error. Our adjusters have went on to assist the insured secure the benefits they were entitled to under their policy. We may be able to do the same for you. 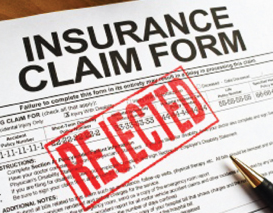 We have reviewed numerous insurance claim denials and have found coverage for many of them. If, however, we believe that the insurance company interpreted and applied the terms of policy fairly, we will advise you accordingly. Insurance companies hire their own adjusters to evaluate an insurance loss with their own financial interests in mind. Make sure you have a licensed and independent property insurance claims & construction expert – a AAA Public Adjuster – on your side. Our highly trained, licensed public adjusters guide policyholders through the often difficult and time consuming process of preparing and filing an insurance claim with an insurance carrier. If one has a viable legal claim or needs to go to court, he or she hires an attorney. If one has a property loss and needs to file an insurance claim, one should hire their own professional insurance and construction expert – a AAA Public Adjuster. Every AAA Public Adjuster obtains policyholders the maximum settlement on their insurance claims. See how we can help.